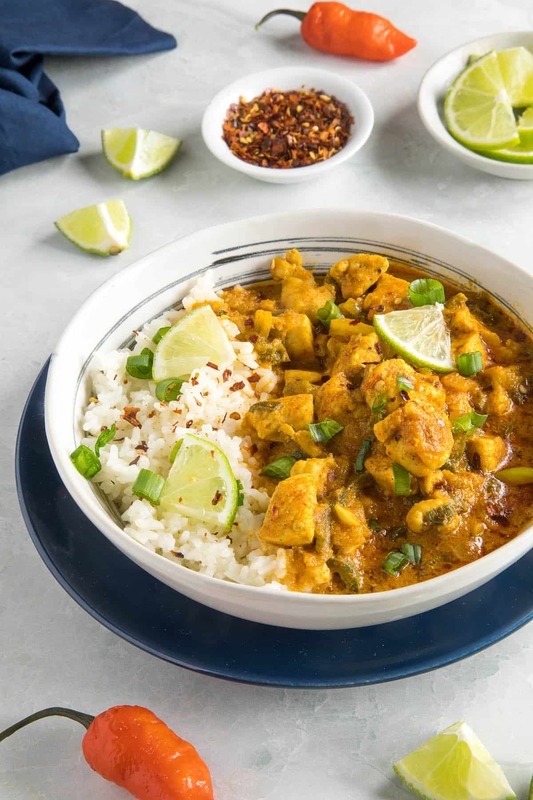 A recipe for quick and easy chicken curry made extra spicy with an addition of ghost pepper and other chili peppers. Chili Pepper Madness style. 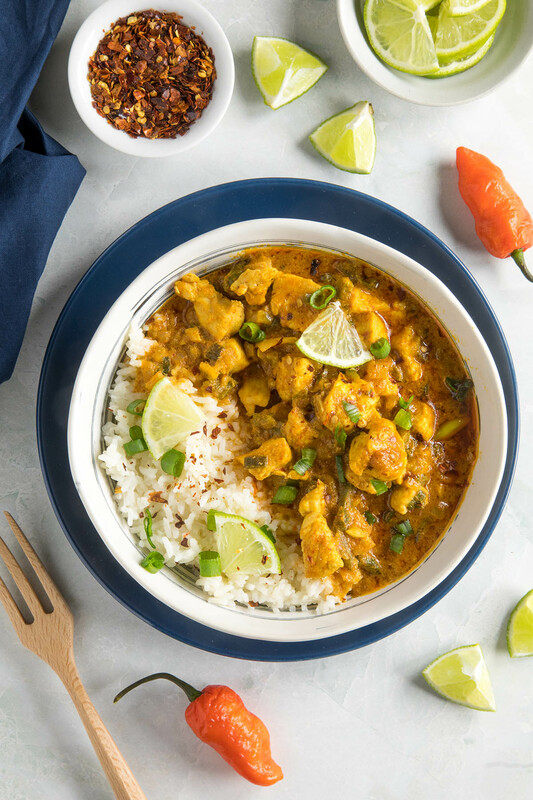 We’re truly spicing up your traditional chicken curry recipe over here at Chili Pepper Madness by bringing in the wonderful bhut jolokia, aka Ghost Pepper. If you like your curry HOT, this is the curry for you. 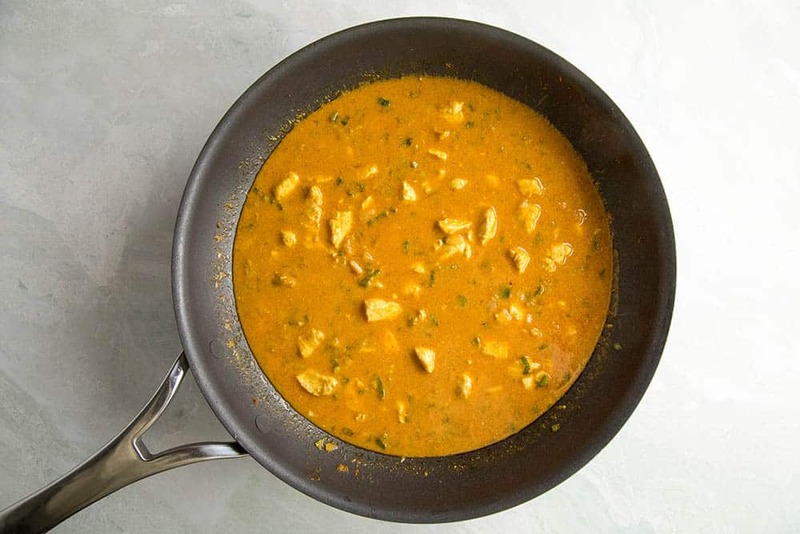 Chicken curry is one of those super quick-to-make recipes, something you can easily have done in 30 minutes or less. Even I, a cook who takes forever in the kitchen, can whip this dish out fairly quickly. It makes for a fast tasty lunch on those busy work days, or a quick dinner when you’re really in the mood to plop down in front of the television with the latest release. You’re probably already familiar with the ghost pepper, but if you’re not, beware. It is consider a “superhot” chili pepper, over a million Scoville Heat Units, so yes, this will truly spice up your meal. Learn more about superhot chili peppers here, along with a list of the hottest peppers in the world. You only need one ghost pepper here. Some chileheads will be able to include more, but if you’re new to the world of ghost peppers and superhots, you can easily tone it down by only including half or a portion of the ghost pepper. Or, you can omit the ghost pepper and add in other chili peppers instead that are more suited to your heat preference. For me, personally, I want the heat! Bring on the ghost peppers. Let’s talk about how we make this recipe, shall we? First, heat a large pan or wok to medium heat and add 1 teaspoon coconut oil. Add your chopped chicken along with chopped jalapenos, ghost peppers and onion. Cook them down about 5 minutes, until the peppers and onions have softened and the chicken is cooked mostly through. It’s a good idea to cook in a well-ventilated room with ghost peppers. Next, add in the garlic and most of the green onions. Cook another minute, stirring, until the garlic is fragrant. Add in the ginger powder, curry powder and paprika. Give it a stir. Stir in the red curry paste and cook it for a minute. Next, add your coconut milk and stir. Bring to a quick boil and reduce the heat. Simmer about 15 minutes or more to let the flavors develop, and the chicken to cook through. 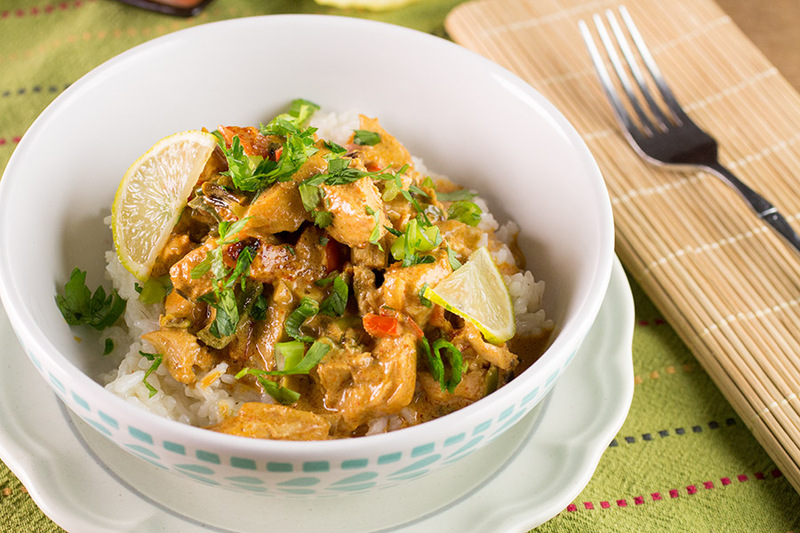 Serve the spicy chicken curry over prepared white rice, then squeeze a bit of fresh lime juice over the top. 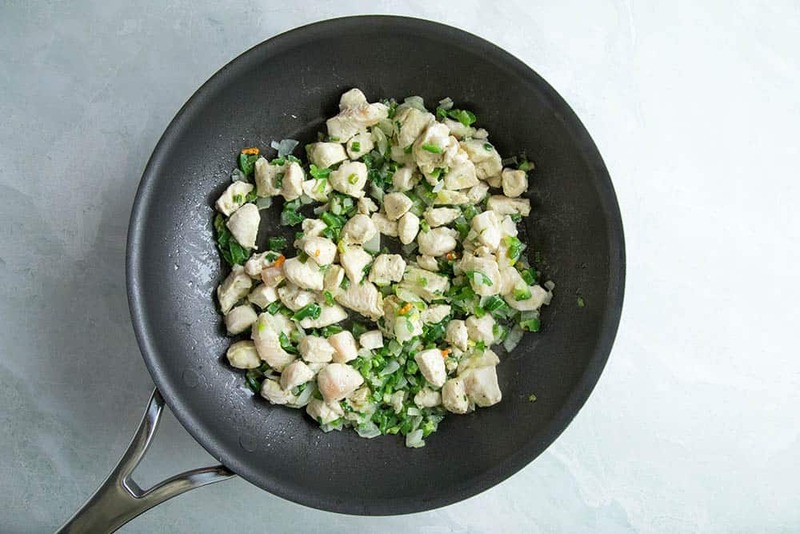 Top with extra green onions, parsley or cilantro, and lime slices or wedges. That’s it, my friends! GREAT STUFF! I love my spicy food! I’m sure you do, too. Be careful handling hot chili powders, especially ghost powder. When working with hotter peppers, including superhots, it is important to wear gloves when handling the peppers both in raw and dried forms. The oils can get on your skin and cause burning sensations. Also see – 10 Tips for Cooking with Superhot Chili Peppers. 1-1/2 cups chopped peppers – I used an assortment but included a white bhut jolokia/ghost pepper for some true heat! 2 cups cooked rice for serving – I used coconut-lime rice! 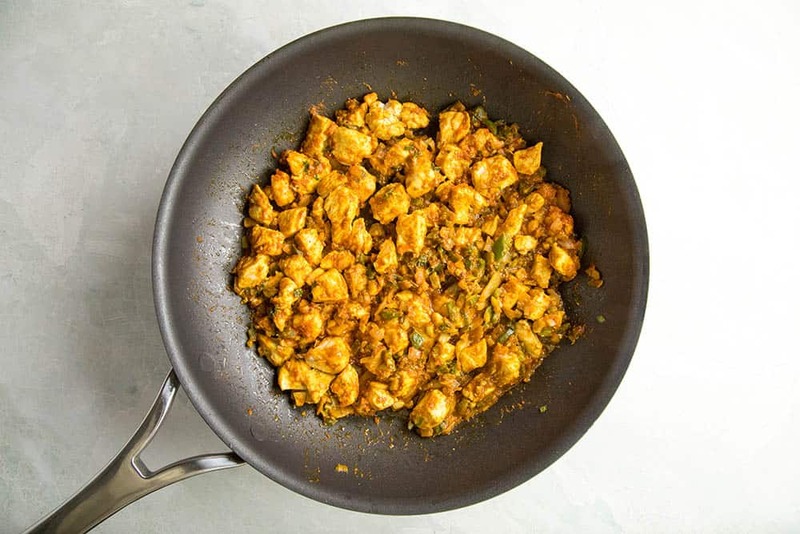 Heat a large pan or wok to medium heat and add 1 teaspoon coconut oil. Add your chopped chicken along with chopped jalapenos, ghost peppers and onion. Cook them down about 5 minutes, until the peppers and onions have softened and the chicken is cooked mostly through. It's a good idea to cook in a well-ventilated room with ghost peppers. Add your coconut milk and stir. Bring to a quick boil and reduce the heat. Simmer about 15 minutes or more to let the flavors develop, and the chicken to cook through. Heat Factor: HOT. You'll get some excellent heat with the ghost peppers. Use milder peppers to reduce the heat. This recipe was updated on 1/8/19 to include new photos. It was originally posted on 1/8/2016. 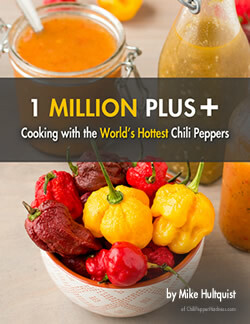 If you enjoy cooking with superhot chili peppers, check out my cookbook, “1 Million Plus+ Cooking with the World’s Hottest Chili Peppers“. If I wish to cook everything from scratch omitting the use of store bought curry powder and paste, what would you suggest as potential alternatives? Thank you for sharing the recipe all the same. Thanks! Try my Homemade Vindaloo Curry Spice Recipe. You can adjust it to your personal preferences. I hope you like it. We LOVE spicy at our house, so I can’t wait to try this recipe! The ghost peppers will spice it up for sure! I LOVE an extra spicy curry. We’re curry freaks in our house and my husband would love this! Just got to source the chillies. I love the addition of lime on this dish too. So awesome with the ghost peppers! My family loves spicy food and this would be a quick yet perfect way to impress them! Thanks Mike. Thank YOU! Yep, the ghost peppers will definitely spice thing up. Enjoy! I love this dish. All the flavors are simply incredible. I will be making this often. Thanks, Edyta! I love this one for sure. Um WOW! This sounds amazing. My husband would love this recipe since it is cooked with ghost peppers. I am going to have to try this. I hope he likes it, Juli! Extra spicy for sure. I do love my ghost peppers. Been following your site for quite some time. First recipe I tried because we happened to make thai gamba curry this weekend and we have dried bhut jolokia. So we thought to give it a shot. Great dish!! My only issue is ill never have enough time to try ’em all haha! REPLY: Thanks, Carl! — Mike from Chili Pepper Madness. I like the look of this recipe, love Thai and Indian of course! I have many ghost pepper plants, still green fruit, but large in size. How many actual fresh peppers would you suggest using for this – not sure what 1 – 1 1/2 cupsequates too? Oh and I made the ‘Home made ghost pepper sauce’ and canned it – awesome – great website too! REPLY: Scott, if you only used ghost peppers, you’d need quite a lot, maybe 20 or so for 1-1/2 cups chopped. That would be very hot. I would use other milder/mid-level peppers, then add in a couple ghosts for heat/flavor, though you may just love it HOT! Nothing wrong with that! Let me know how it turns out. — Mike from Chili Pepper Madness. This looks so good. I have never cooked with ghost peppers before, I’ll have to look for them next time I go grocery shopping. How much ghost pepper powder for this recipe? REPLY: Stef, if you use powder instead of fresh, I would use just a half teaspoon to start. You can always add more. If using a blend that isn’t quite as hot, a teaspoon will be good. — Mike from Chili Pepper Madness. I really like your site but I can’t make a lot of the recipes because I cannot find most of the types of hot chiles called for. Do you grow your or are they readily available in the grocery store? REPLY: Rita, we do grow peppers but have many available to us. You can also order online, or sub in other peppers you CAN use but then supplement the recipe with dried ingredients, like chili powders or seasonings. — Mike from Chili Pepper Madness.